Some good news if you are looking for a podiatrist on the Northside of Brisbane, the Entire Podiatry Chermside clinic now has extended opening hours. Appointments to see a podiatrist at our Chermside clinic can now be made from Monday to Friday, with Saturday appointments also available. The Entire Podiatry Chermside clinic is located within the Chermside Medical Complex, a medical services building purposed to meet all of your medical needs. Conveniently located within the same building as several other medical and allied health specialty services, our Chermside clinic is equipped with state of the art podiatry facilities including Doppler assessment equipment and video gait analysis technology. In addition to Lisa and Chris, Richard Langton has recently become a valuable addition to the Entire Podiatry team at Chermside. 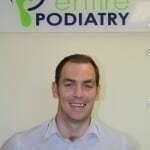 Richard began working with Entire Podiatry at the start of 2012. Richard provides excellent quality treatment for any foot-related condition, and his sincere and considerate nature makes him very popular with his patients. Richard has special interests in diabetic foot care, Aged Care, and treatment of patients under the Department of Veterans Affairs (DVA) scheme, as well as conditions affecting the biomechanics of the lower limb. Richard is also a passionate cyclist and trains daily, riding the roads around the Great South East. In September, Richard is participating in the invitation only ‘Ride for Smiddy’, a 1600km cycling trek from Brisbane to Townsville, to raise funds for Melanoma research. Appointments with Richard are available at our Chermside, Strathpine, or Logan clinics. Podiatrists Lisa and Chris are also available for appointments at our Chermside clinic. Call 1800-4-ENTIRE to with further enquiries or to make an appointment with any of our podiatrists.